A group of U of T Scarborough students recently stepped out of the classroom and into a stylish Queen Street gallery to exhibit an original piece of art highlighting mixed race issues. The multimedia art piece was created by students in Professor Minelle Mahtani’s Critical Mixed Race Theory class and inspired by an assignment they did on the diasporic histories of family members. “We wanted to engage the community beyond our classroom in a conversation about mixed race issues and this provided a perfect setting for that conversation to take place,” says Mahtani, an expert on mixed race theory. Mahtani was impressed that the piece challenges many of the prevailing stereotypes about multiraciality, particularly that it’s a recent phenomenon, that mixed race people exist in a confused state of identity or that mixed race couples offer the clearest path to eliminating racism. The art exhibit was part of a day-long conference called M.I.X.E.D that was organized by Rema Tavares, a Toronto-based artist, educator and founder of Mixed in Canada, a national cultural resource centre for mixed-race identified Canadians. 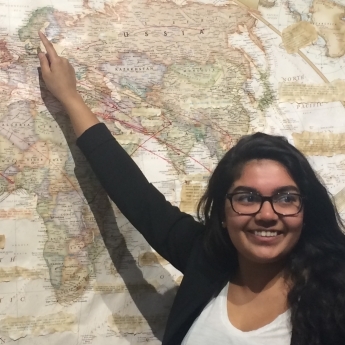 The piece created by the UTSC students includes a wall-sized map of the world with red lines that originate in Toronto and crisscross the globe. There’s also an audio recording of each student reading from their essays that is blended together resulting in something that sounds like a new language. “I’ve never been in an environment where everyone was so engaged and wanting to know more about our project,” says Andrew Furgal, a fourth-year history and geography student. For his assignment Furgal explored his father’s Polish roots. He discovered that when his father first came to Canada to work he witnessed racist attitudes existing within his community. His father didn’t speak much English and settled immediately into a Polish-speaking community in Toronto where Furgal’s father saw prejudice towards those living outside his community. He says it was an interesting first-hand look at what happens when ethnic communities are separated from each other and there’s a lack of interaction and understanding.